After our stay in Kyoto we hopped back on a bullet train, this time headed towards Hiroshima. Our ride on the Shinkansen was under two hours long, direct and as always very pleasant. Because we left Kyoto bright and early, we arrived in Hiroshima just before 10 am. That let us spend a few hours in Hiroshima itself, before catching a ferry to Miyajima Island in the late afternoon. 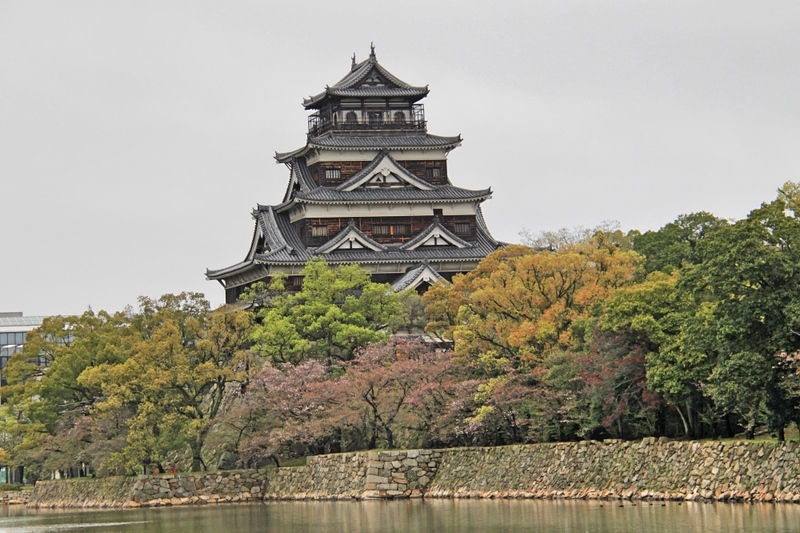 The Hiroshima Castle viewed from across the moat. Our Shinkansen train to Hiroshima. Hiroshima is a very famous city for a really sad reason. On the 6th of August 1945, Hiroshima was the first city targeted by a nuclear bomb during WWII. After the devastation, Hiroshima was rebuilt from the ashes, becoming a large metropolis of over a million people. 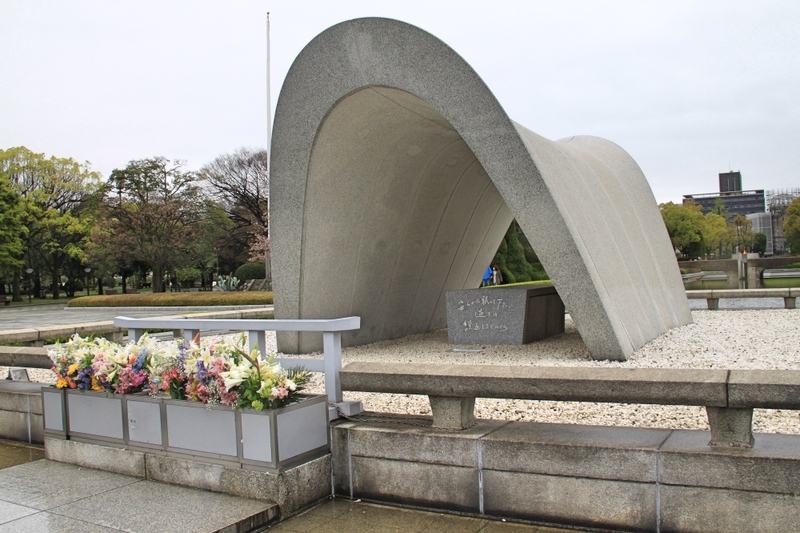 One of the main reasons to visit Hiroshima is of course to visit the Peace Memorial Park. 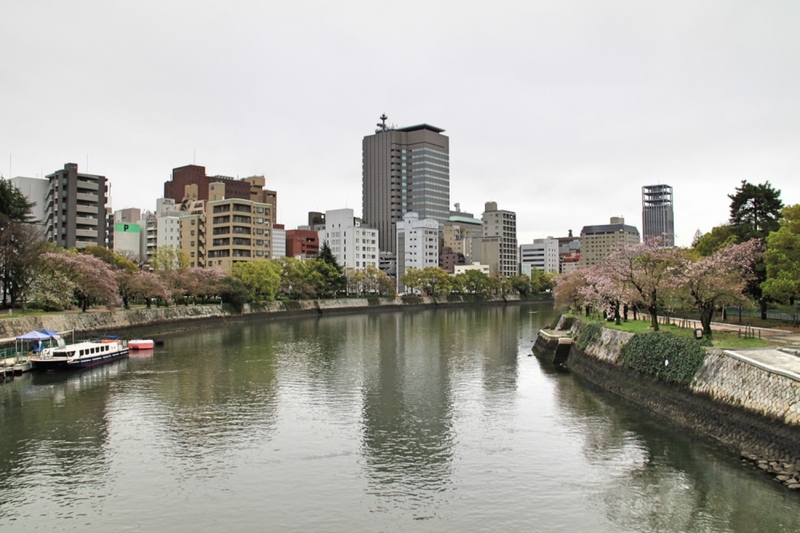 Hiroshima’s skyline and the Ōta River. From the Hiroshima station, we hopped on Tram no. 2. The tram terminal is at the southern exit of the station and is easy to find. You can also take tram no. 6; whichever comes first. The Genbaku-Domu-mae (Atomic Bomb Dome) tram stop is a roughly twenty-minute ride away. 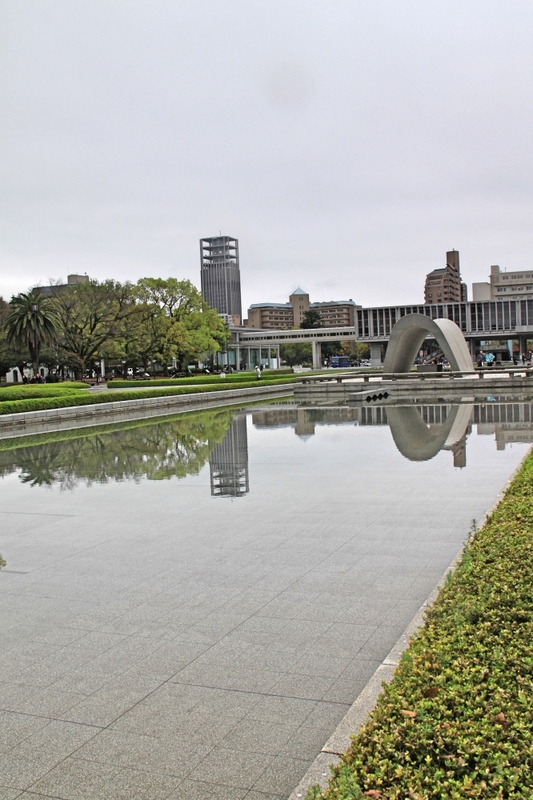 All of Hiroshima’s main sights surround the Peace Memorial Park. Once there you can cover the entire area on foot. 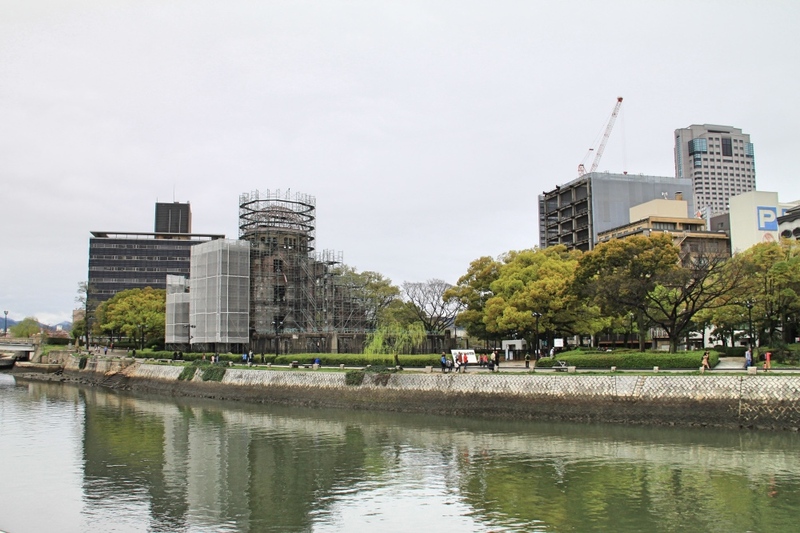 The only building that was not rebuilt after the war is the Hiroshima Prefectural Industrial Promotion Hall which has now been renamed the Atomic Bomb Dome. The nuclear blast occurred almost directly over this building, killing everyone in the area instantly. With its solid construction, the hall was one of only a few buildings near the epicentre left standing after the explosion. 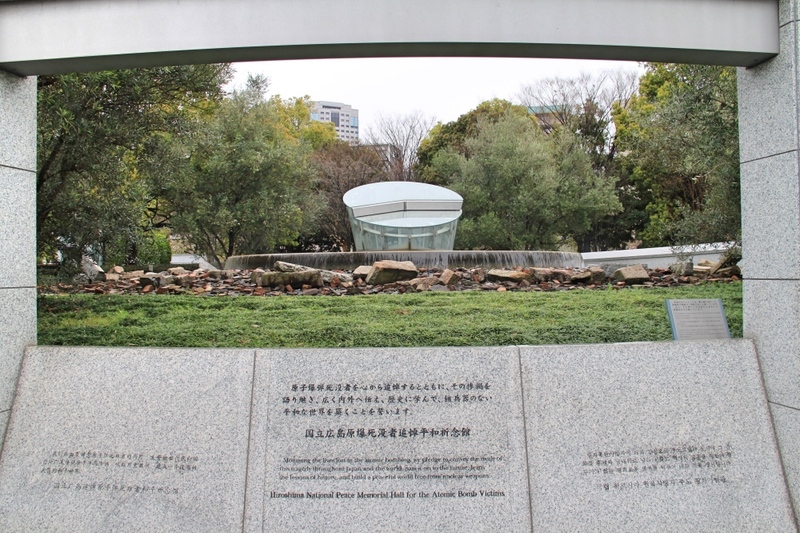 It quickly became a symbol of the tragic bombing, leading the city of Hiroshima to leave it untouched. The ruins have now been declared a Unesco World Heritage Site. This is a very moving place which remains quiet and peaceful, even with all of the visitors and the busy city that surrounds it. When we visited it was under renovation and covered in scaffolding. The Atomic Bomb Dome undergoing renovations. This large green park is a great place to walk through and check out the many war memorials. 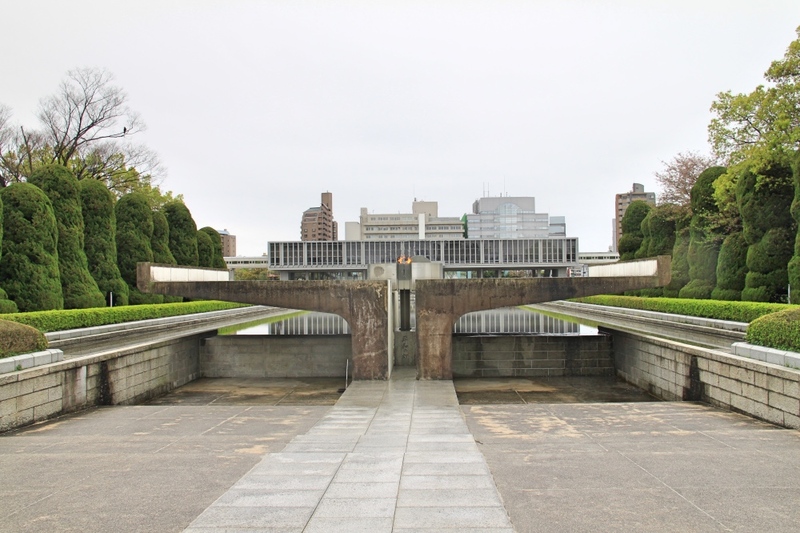 The ones not to miss are the Cenotaph, the Children’s Peace Monument and the Hiroshima National Peace Memorial Hall for the Atomic Bomb Victims. The peaceful Peace Memorial Park. The Cenotaph is a large monument and water feature commemorating the victims of the blast. It contains a register of all who died when the bomb hit, or as a result of exposure to radiation. 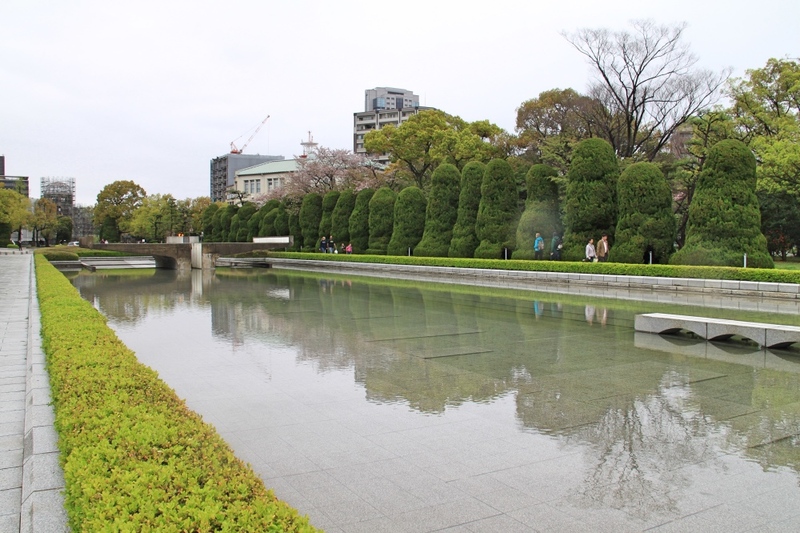 Through the arch of the Cenotaph, you can see the Flame of Peace and the Atomic Bomb Dome on the opposite side of the water feature. The flame will burn as long as there are nuclear weapons on the planet. It’s a place where you can pay your respects to those who died, and many Japanese school kids visit the site for that reason. The Cenotaph across the pond. 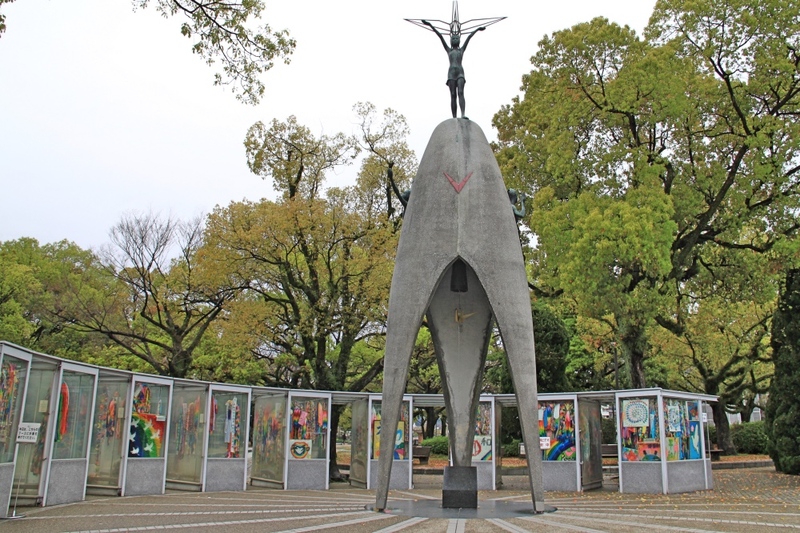 Next door to the Cenotaph is the Hiroshima National Peace Memorial Hall for the Atomic Bomb Victims. This memorial is free to enter, quite small and mostly underground. A spiral walkway takes you down to the Hall of Remembrance which reflects the bombed cityscape from the hypo centre. A fountain in the middle depicts the time (8.15) of the bomb blast. Another room holds the names and faces of all who died and a few videos of survivors’ stories. The Hiroshima National Peace Memorial Hall for the Atomic Bomb Victims. The Children’s Peace Monument is very moving. A little girl named Sadako Sasaki inspired this monument. Another victim of the nuclear bomb, she died of Leukaemia at the age of twelve. Sadako began folding paper cranes on learning of her illness. She hoped that she would recover if she folded a thousand cranes. Cranes are a symbol of longevity and happiness in Japan. 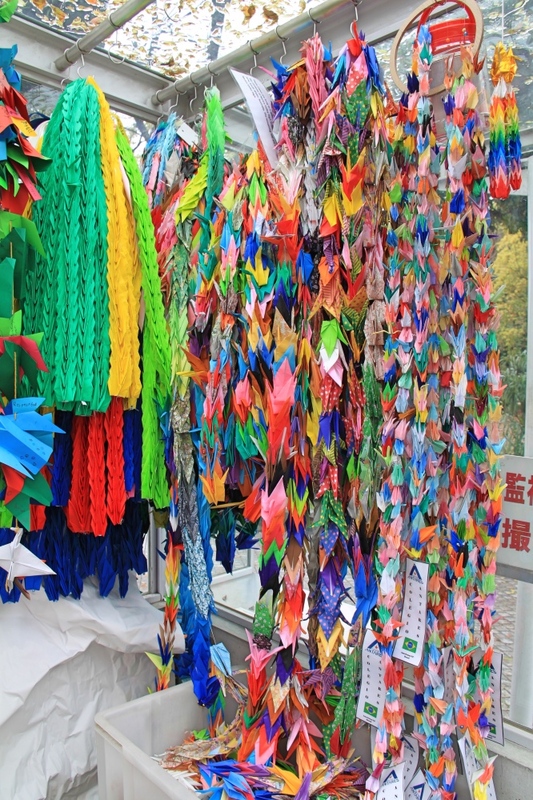 Unfortunately she died before reaching her target, but her classmates finished folding the remaining cranes. The paper crane has now become a symbol of peace. Thousands of cranes, folded by people from all over the world, lie at the base of this monument. Lots of colourful paper cranes at the Children’s Peace Monument. It’s essential to visit the Peace Memorial Museum to learn the full story of one of the saddest days in history. Its many exhibits present an in-depth and very upsetting look into the events of this tragic day, the damage to the city, and the tens of thousands of people who lost their lives or loved-ones in the aftermath. 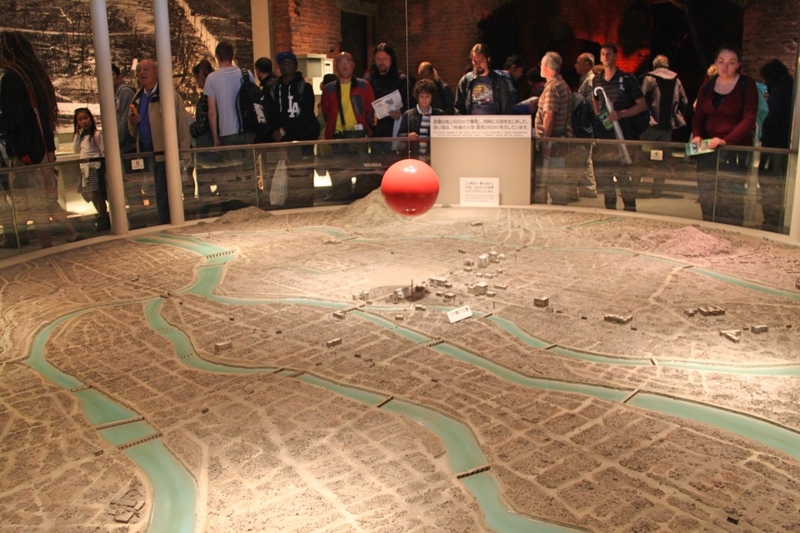 A model of where the blast occurred above the city. I couldn’t help but shed some tears when we saw examples of the items recovered from the rubble, such as children’s toys, books or pieces of clothing. Be warned that some of these displays are quite disturbing, such as statues of children walking with skin melting off their bodies. Although it was very sad and sombre, the museum really showcases the dangers and the horrors of nuclear weapons. It is a very good reminder for us to avoid nuclear war at all costs. 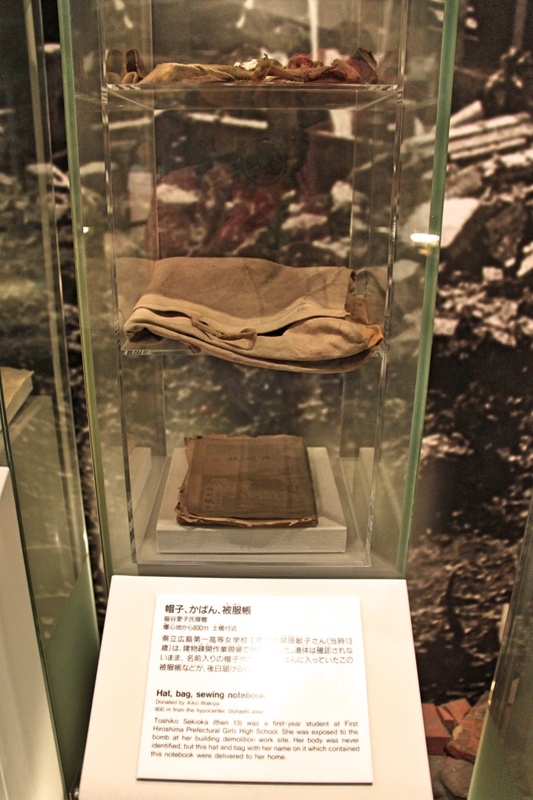 Some items from a school student recovered from the rubble. More items recovered from the day. 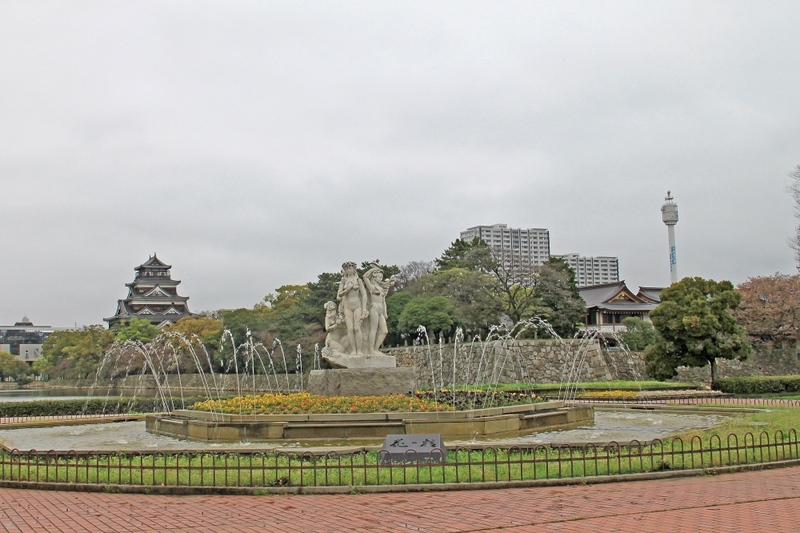 After exploring the Peace Memorial Park and the museum we took a short walk north of the Peace Memorial Park to the Hiroshima castle. 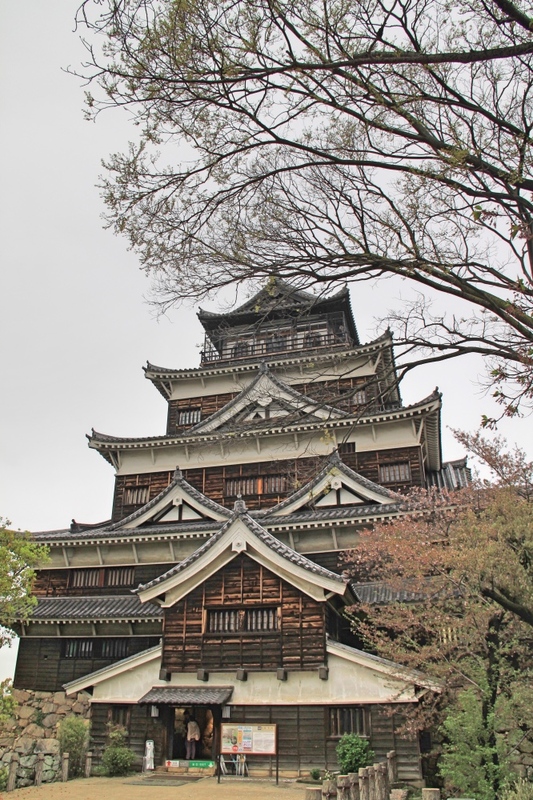 The bomb blast totally destroyed Hiroshima Castle, but in 1958 it was rebuilt in its original form. If you have the time you can pay to go inside. Instead, we simply enjoyed wandering around the grounds and checking out the castle’s impressive moat. The castle is beautiful and worth a quick stop. Beautiful gardens near the castle. Fee: Y370 per adult to enter the castle. The castle grounds are free to explore. Where to eat in Hiroshima? We were feeling pretty hungry after all that walking. That called for a pit stop for some hearty food and a tasty Japanese beer! Hiroshima’s speciality is their own version of Okonomiyaki, or as we like to call it, the Japanese pancake. 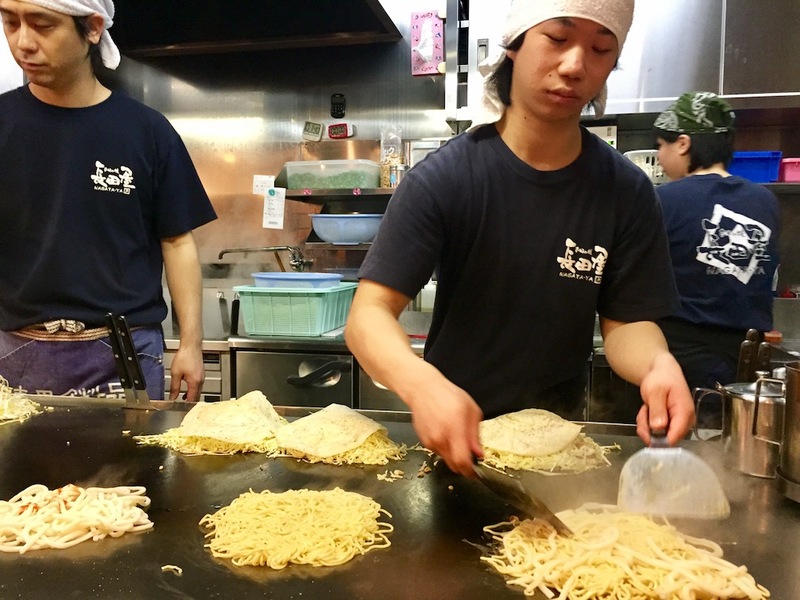 In Hiroshima, they layer their Okonomiyaki, rather than mixing the ingredients together before frying. Oysters and Squid are also popular toppings in Hiroshima, although you can easily go without them if you’re not a fan of seafood. Thanks to Tripadvisor we found a fantastic Okonomiyaki restaurant called Okonomiyaki Nagata-ya, just a short walk from the peace park. 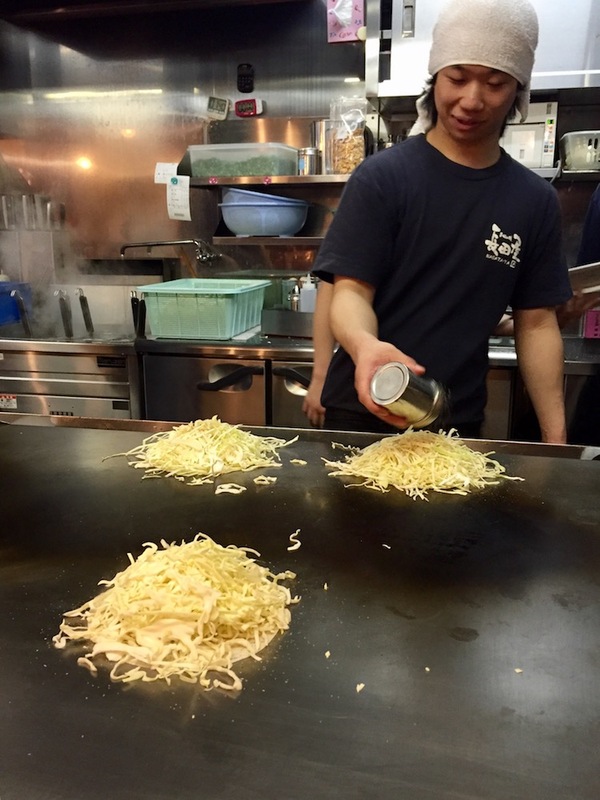 You might remember from our post on Kamakura how much fun we had cooking our own Okonomiyaki. We were keen to do that again in Hiroshima, but the only space left was at the bar. Fortunately sitting right in front of the grill let us watch the experts themselves create our Okonomiyaki. Of course, they turned out way nicer than any we could have made ourselves. They were so delicious and filling! No we didn’t eat all of these! That was the end of our visit to Hiroshima. Our next stop was the island of Miyajima, a short ferry ride away. But we’re so glad we visited this incredible, strong city. If there is one thing we should take away from Hiroshima, it’s that war solves absolutely nothing. It simply destroys the lives of innocent people. If we leave there with that realisation then there is hope for the world to become a much better place; a world that we all want to live in, and a safer world for our future generations. what an amazing place to visit. Very chilling – particularly the items found in the rubble. I love the look of the Okonomiyaki though…good comfort food! Yes the Okonomiyaki were delicious! We did a similar visit to you for a half day in Hiroshima but we didn’t go to the castle, rather we headed straight to Miyajima after lunch and spent the afternoon, evening and next morning there. I found the peace museum and various memorials very moving. We loved Miyajima, such a beautiful island. We also spent the night and it was great to have the place to ourself in the evening once all the day trippers had gone. Japan is really interesting. That castle is pretty and the Oikonomiyaki looks really good. Where did you go after? We went to Miyajima for a couple of days and then on to Osaka. Those Okonomiyaki were so good!! Japan has been on my bucket list for so long! So keen to try the bullet train, love Japanese food and as your photo shows cooking in front of you. The castle is a nice change from the typical European style. Lovely. 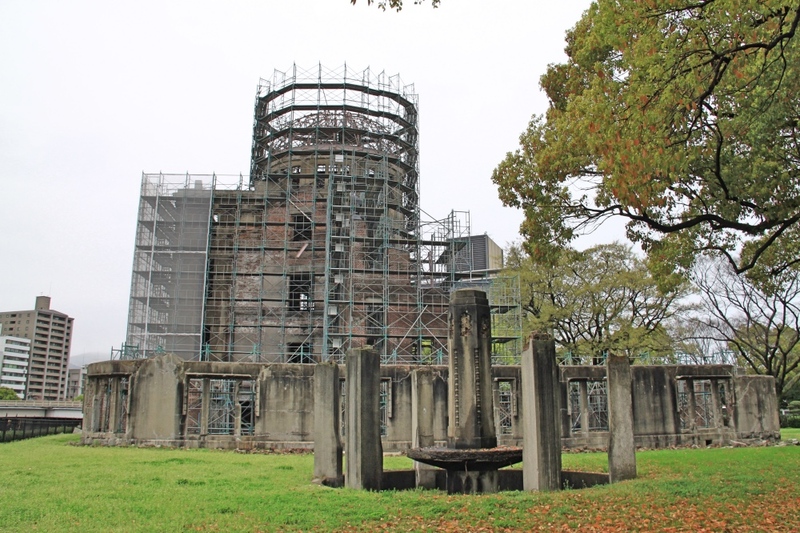 The Atomic Bomb Dome would certainly be a very moving place to visit. I am glad it’s a UNESCO site…would help in spreading the message of peace and also help in it’s preservation. 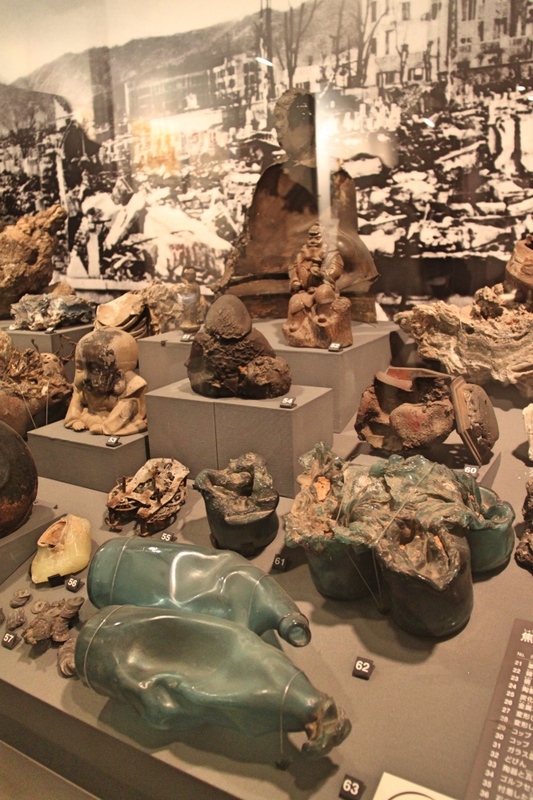 I never realized just how much there was to do in Hiroshima. I bet that many of these sites were really hard and humbling to walk through. The Children’s Peace Monument looks absolutely stunning and moving! Thanks for sharing! Hirosihma looks like a good city to visit despite its history. Everything looks so peaceful from your photos. 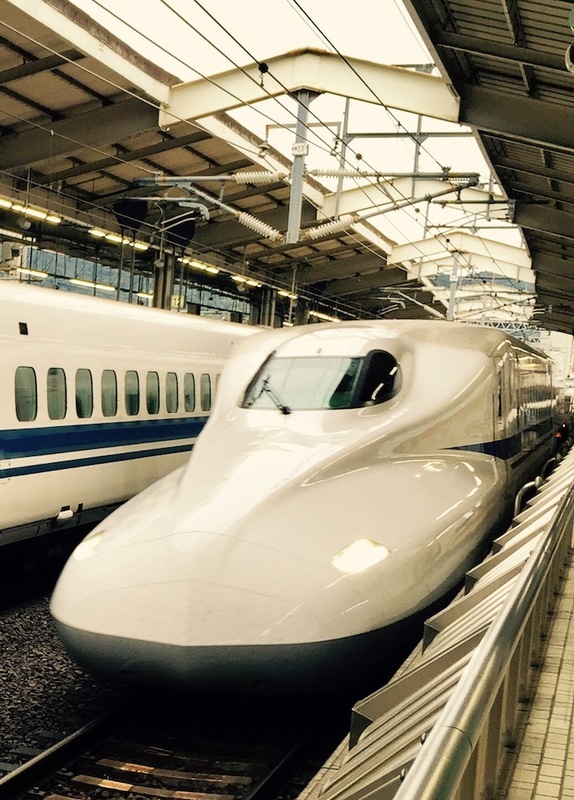 How much did the bullet train cost? The bullet train is pretty expensive, we had a JR pass as we travelled a fair amount within the country. It covered all our train rides as long as they were with the JR company. You can choose between a 7, 14, or 21 days pass depending how long you are in Japan. If you are going to do any long distance travel like Tokyo to Kyoto or something similar it is worth purchasing a pass. As it is almost the same cost as paying for a one way fare in the bullet train and you can then use it for as many trips as you want within that period. Hiroshima looks like a very interesting place to visit. I would love to visit it one day and learn about all its history.